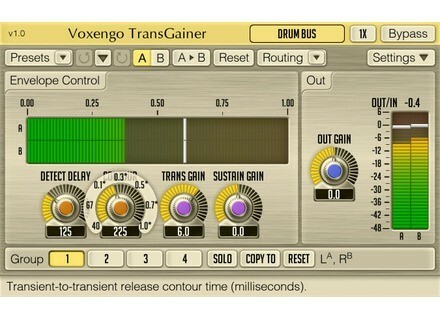 TransGainer, Software transient shaper from Voxengo. Voxengo TransGainer implements an audio signal envelope adjustment algorithm that reacts on transients rather than on a signal’s loudness level. TransGainer is available in AudioUnit and VST plug-in formats (including native 64-bit support), for Mac OS X (v10.5 and later), and Windows computers. Note that on Mac computers, TransGainer now supports Mac OS X v10.5 and higher only, running on Intel processors. Mac PowerPC support is not available. A problem with the Global Settings sliders missing fixed. Side-chain routing presets now appear dimmed to reduce confusion. Longcat Audio H3D Binaural 2.1.1 Longcat Audio Technologies has announced the availability of H3D 2.1.1, an upgrade to their 3D binaural plugin. iXimix TrakProDJ Deluxe Edition TrakProDJ Deluxe Edition is the 4 Deck version of the TrakProDJ control software. Kick Free Revolution Vol.3 Resonance Sound presents their newest release - Kick Free Revolution Vol.3 by Sounds of Revolution.